Small Removals To Spain - Why Would You Leave Some Items Behind? Small removals to Spain can be useful for a number of reasons. It isn�t always necessary to take everything you own with you when you move to Spain, and removals companies will be happy to take smaller loads for you. What are the reasons you might want to leave some items behind? One reason to keep your Spain removals small is that you could be moving to a temporary property. It could be that you haven�t yet found the apartment, villa, or house that you are going to live in full time, so you choose to rent on a temporary basis. This might be a much smaller property than you are intending to move to in the end, and your possessions simply may not fit. Taking a few with you in smaller removals to Spain loads would be the solution. You would have your most essential items with you while the rest could be kept in storage. A second reason for a small Spanish removal is that you may just be �testing the water�. You may not decide to live in Spain permanently after you have tried it for a little while, and it would be more cost effective to only take a few essential items with you for that trial period. Maybe you are only moving to Spain for work, and intend to come back to the UK after a few months. Or perhaps you are going there to visit relatives, and this could be a temporary situation. If you then want to return to the UK, it will be easier without having to organise a large scale removal from Spain. 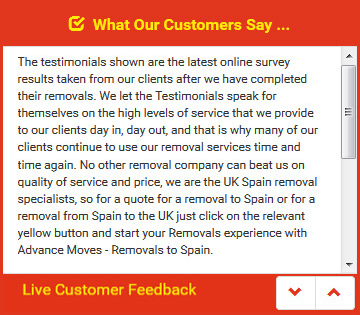 Small removals to Spain are perfectly possible, and Advance Moves (http://www.advancemoves.com/) are more than happy to accommodate them. We have a range of van sizes that will suit every need. For more information, please don�t hesitate to get in touch on 0871 218 0612 or email info@advancemoves.com.